Kneel on the floor with your thighs and feet together. Point your toes back. Place your palms on your hips. Stretch your hips forward, lift your chest up, curl your spine back, and extend your ribs. On an exhale, place your palms on your heels or the soles of your feet. Push your palms into your feet, "throw the head back," and push your spine forward and up. Keep your thighs straight up and down, perpendicular to the floor. Engage your glutes, deepen the stretch, and remain in the pose for 30 seconds. To exit, place one hand on your hip, then the other. Rise up, then sit on your heels. 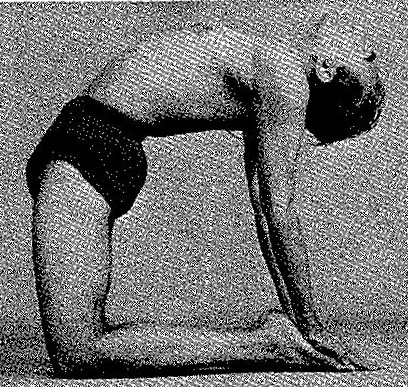 Iyengar's thighs and feet are together, as he recommends in his technique. I have kept mine at the width of my hips. This helps me feel more stable and leaves more space for my shoulders and hips in this pose. This pose is a great example of how Iyengar's difficulty ratings do not always reflect the experience of yoga students. In Denver, Ustrasana is usually considered a very challenging pose, and many students find that it flares their low back pain. So take these difficulty ratings with a grain of salt and listen carefully to your own body!